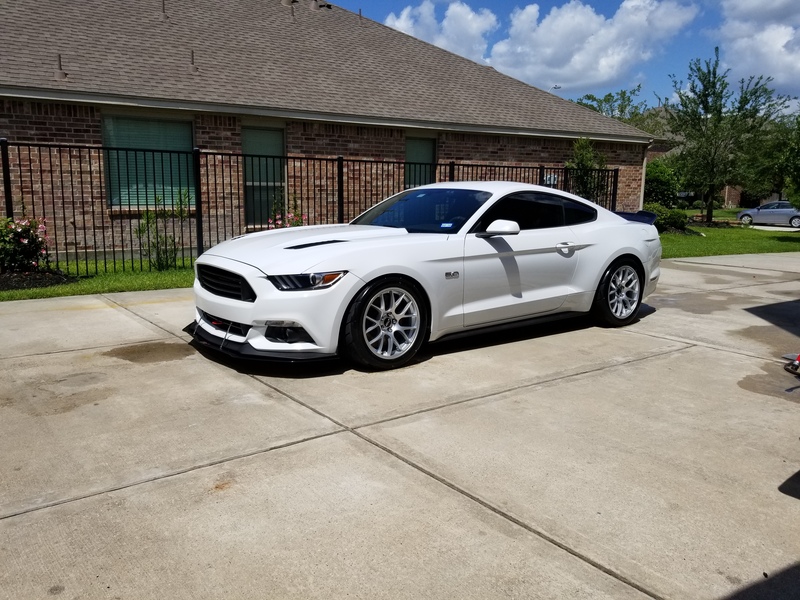 I bought this car new in early 2016 while my other project car (2009 G8 GT) was down due to transmission failure. My goal is to build a NASA AIX Mustang race car I can compete with. In the interim I’m going to have fun with it as a street and track day car while building it. This car is heavily modified with a supercharger, custom fuel system and it runs on race gas. In retrospect I should have bought a body in white and built my own car. However, it would have never been street legal since those bodies do not get a VIN. Ultimately that won't matter, but it is fun to drive it around on occasion. It's such a ridiculous car! What are the "Performance Pack" features? Performance Pack includes some aggressive features to further enhance the S550 GT’s performance! Below is a list of what it came with. Six-piston Brembo front calipers with 380mm one-piece ventilated discs provide maximum stopping power. This is an upgrade over the smaller four-piston brakes the standard GT comes with. Testing reports show that deceleration from 60 to 0 miles per hour improved from 117.9ft to 108.5ft. It even shaved 3ft in 30-0 testing! A Torsen differential was fitted to give the Mustang better road course traction. The upgraded 3.73 super 8.8" gear set gives a mechanical gearing advantage. The downside is higher revs at highway speeds due to the gearing. This is not optimal for long commutes, but perfect for ripping around the track. To improve handling and grip the suspension was upgraded with Ford Performance parts. Improved struts/shocks, springs, k-brace, strut brace, and rear stabilizer bar. Reports show skid pad lateral g-forces as high as 0.94 vs. 0.85 on the non-PP model. Slalom was also improved from 65.0mph to 69.3mph! Huge difference combined with the braking improvements. Overbearing digital nannies can ruin your fun. To combat this Ford tweaked the stability control programming for PP equipped Mustangs. The EPAS and ABS programs were also tuned to be more aggressive. This provides a better experience for newer track drivers that may prefer the nannies on. Ford missed the boat with their selection of wheels and tires for PP equipped cars. 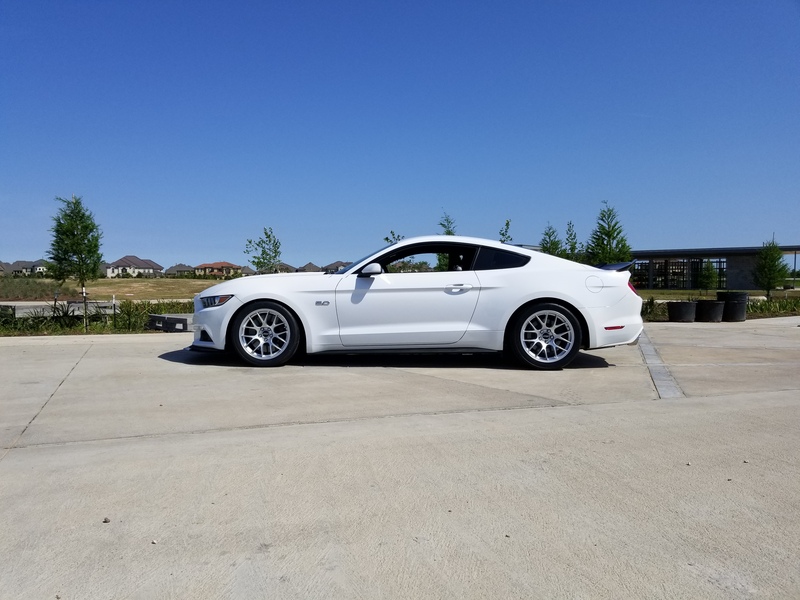 Staggered 19x9" front and 19x9.5" rear wheels came with 255/40R19 and 275/40R19 tires. Tires are "upgraded" to summer compounds in the form of Pirelli P-Zeros. While the wheels look good and the tires seem fancy, they're sub optimal to say the least. You can't rotate staggered wheels. That means faster tire wear on the track and huge costs. Furthermore larger rear wheels mean more rear grip than front grip, causing understeer. Worse yet the wheels are incredibly heavy. They look great, but upgrading to light weight 18" wheels in a square setup will boost performance. It will also offer lots of racing tire selection. As for tire compounds, the Pirelli P-Zeros are hardly an upgrade, they have horrible wear life and no grip. They aren't budget tires either! Compared to Michelin Pilot Super Sports, the P-Zeros lose in every conceivable way. PP equipped cars feature a front splitter, oil and vacuum gauges, and RECARO bucket seats. 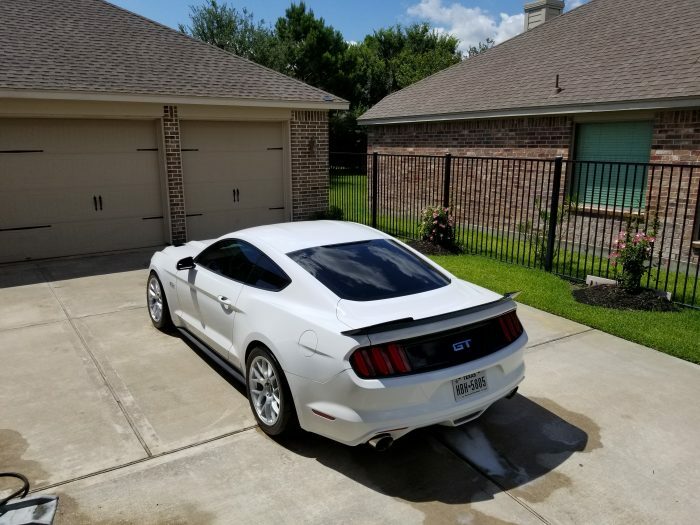 The tiny factory GT spoiler is also shaved off the car's trunk. It's assumed most PP owners will adorn their car with a custom spoiler or wing of their choosing for track use. To keep these track cars frosty a larger radiator fitted up front ensures the Coyote 5.0 engine stays cool. This car is being transformed aggressively and was supercharged at just over 4,000 miles. I parted with my warranty a while ago, no mod is too extreme to consider! 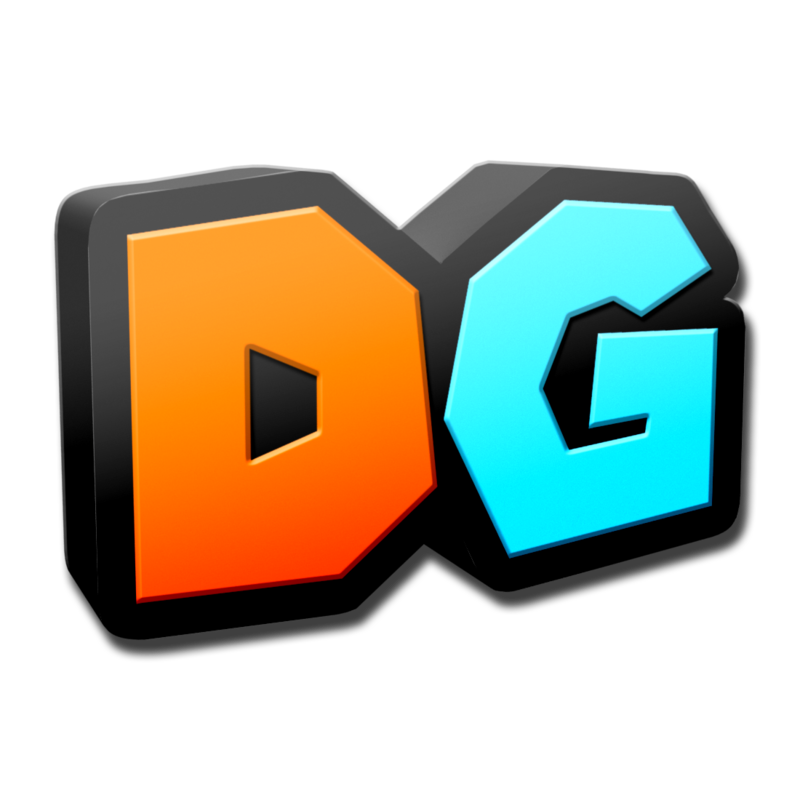 Check out my list of current mods below. Then scroll down to see the build log mile by mile! Part of the Stage 2 kit is the 1103ci Air-to-Air intercooler. It provides consistent low intake temperatures. The tuning package that ProCharger included with my kit was the E-Motion nGauge. I ended up continuing using the nGauge with my Lund Racing tune. John Jr from Lund tuned my car for race gas and my custom fuel system. Had a great experience working with him. Unfortunately ProCharger's Stage 2 kit for the S550 mustang uses some cheesy worm gear clamps in a lot of places. I was having issues with them coming loose and switched to HPS Spring Loaded Induction T-Bolt Hose Clamps. I think the FlexLP hose I purchased from Fore Innovations is the best hose to use for a race car application. It's very easy to install like more traditional rubber hoses, but it doesn't smell at all. It's more bendable than PTFE as well. The only downside is that it must replaced every 5-7 years. To improve throw during shifts I picked up a Raceseng White Cue Ball weighed 1.49lb (675g) shift knob. Most traditional camber plates, like the ones I selected, fit inside the strut towers. Some cars have openings big enough to adjust them. The S550 mustang does not. I cut open my strut tower tops to allow more access. I did it with a cutting wheel on a grinder. I thought the factory front grill was a little weak. After a short wait the MMD V-Series Upper & Lower S550 Mustang Grilles hit the market. I wanted to add an aggressive looking rear spoiler. 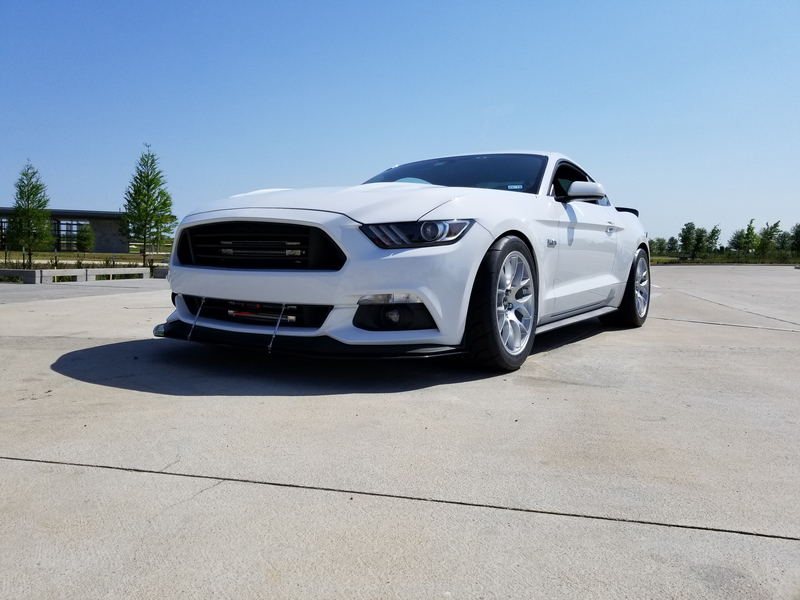 The MMD V-Series Rear Spoiler was a perfect match with my MMD front grilles. 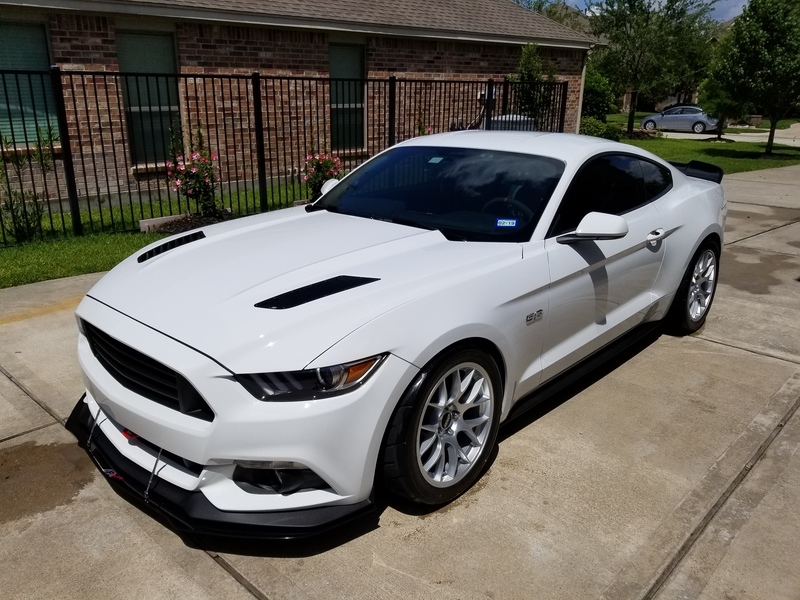 To keep my supercharged Mustang cool and to improve aero I cut my hood up and installed TrackSpec Motorsport's S550 GT Direct Replacement Hood Louvers for 2015-2016 Mustangs. A slight luxury touch for an otherwise brutal car. The Ford Performance GT350R alcantara, leather and smoked chrome steering wheel is a great fit for my build. One of the best radar detectors on the market is the Valentine Research V1 Radar Detector. It's famous for it's directional arrows and dual antenna design. However the Max 360 recently began offering this design and I believe others are as well. Still this is one of the best out there! To avoid bulky cabling I routed my V1 radar detector to the mirror for a DIY hard wire tap. Ugly incandescent side markers are no good. Diode Dynamics has very attractive LED replacement side markers that plug right in. To shed weight and make space for this track build the AC system has been deleted. This includes the compressor, lines and condenser coil. The evaporator coil will be removed later when the interior is fully gutted. I removed all of the rear trim, trunk trim, hood trim, engine cover, windshield wiper nozzles, and wiper fluid tank. More of the car will be gutted as the build progresses to full race spec and definitely in time for a full cage. In pursuit of grip, race tire selection, and weight reduction I decided to upgrade my wheels. Gangup was offering a group buy deal on APEX EC-7 wheels. I configured mine as 18x11" ET52 in a square setup. I wanted to get a square setup and bought four 18x11 wheels. To match the wheels I decided on Toyo Proxes R888 305/35R18 tires. They are a very aggressive fitment up front but handle amazingly!